Live it! 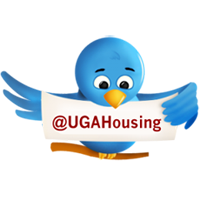 UGA Housing: It's Roommate SURVIVOR Week! University Housing is excited to announce Roommate Week Part II - SURVIVOR Week! This week, you and your roommate have the opportunity to win BIG by participating in our Roommate Survivor Insta-challenge and attending The Roommate Survivor Show at 6:30 p.m.
*Insta-challenge winners will be announced at The Roommate Survivor Show. If you're not big on Instagram, don't worry! You can also win big by participating in The Roommate Survivor Show! Roommate pairs should show up to the Brumby Rotunda ready to compete by 6:30 p.m. on Wednesday, September 11. We've got some awesome prizes for 1st, 2nd, and 3rd place roommate pairs that you won't want to miss. So don't show hesitate; this event is first come, first serve!